Paul A. Krystoff, age 101, of Wellsboro, passed away peacefully on Saturday, March 23, 2019, at UPMC Susquehanna Williamsport. He shared over 60 years of marriage with the late Evelyn (Davis) Krystoff, prior to her passing in 2005. He was born on December 6, 1917, in Antrim, the son of the late John and Anna (Wozniak) Krystoff. Paul worked in the packing/shipping department of Corning Glass Works in Wellsboro, retiring in 1976. He was a man of great faith and attended church services as a member of St. Peter’s Catholic Church, Wellsboro. He was a huge sports fan, especially when it came to his New York Yankees or horse racing. 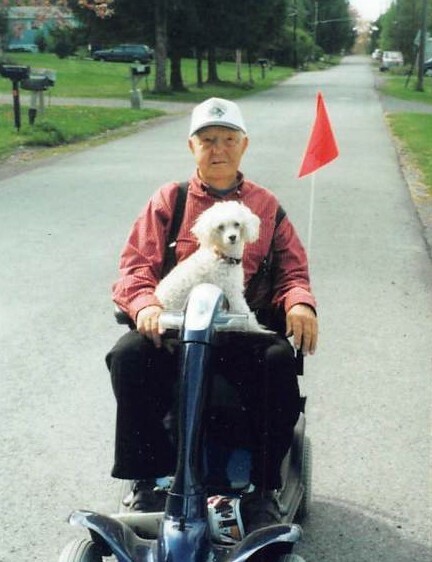 He also enjoyed fishing and riding his scooter around town with his dog, Cece. Paul will be missed by family and friends for his teasing sense of humor and his strong-minded personality, which he had right up until his passing. Left to cherish his memory are his son, James Krystoff, of Antrim; daughter and son-in-law, Nancy and Irving Buettner, of North Fort Myers, FL; sister, Antoinette Davis, of Wellsboro; several nieces and nephews; many dear friends. In addition to his parents and beloved wife, Evelyn, Paul was preceded in death by his brothers, Joseph, Ray, Stan, Steve and Edward. Family and friends are invited to pay their respects on Friday, March 29, 2019, from 11 a.m. until 1 p.m., at Tussey-Mosher Funeral Home, Ltd., 139 Main Street, Wellsboro, PA 16901. Paul’s memorial service will immediately follow at 1:00 p.m., with Rev. David Bechtel officiating. Interment will take place in the Antrim Cemetery, Wellsboro. To share your fondest memories of Paul, please visit www.tusseymosher.com.